Click on picture to go to Reverbnation. 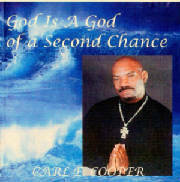 God is a God of a 2nd Chance is a beautiful gospel song written and sung by Carl E. Cooper of Los Angeles, California. This song is sure to encourage many for who doesn't need a second chance.